The Alumni Cup – where do we go from here? Sean Colfer of Phat ed’s and EMO fame brings us his views on The Alumni Cup and its future. After last year’s relatively successful debut in Manchester, the Alumni Cup returned to run alongside the UKU University Open National Championships in Nottingham. Leeds mounted an impressive defence of their title but in the end ceded the crown to Bangor, who used a large squad and strong team chemistry to overcome some of Leeds’ more impressive individual players. So, with a second year of this event in the books, what does the future hold for the Alumni Cup? The key issue with the Alumni Cup concept is what people want from the event. Is this intended to be a competitive tournament to truly find the best alumni team in the UK? Is it an event to keep graduates who have no interest in intense club competition engaged with Ultimate? Is it an attempt to forge links between alumni and current students? Is it an excuse for a reunion, a glorified catch-up and drinking opportunity? Last season there were 16 teams in the competition – this year that shrunk to 12. This season also lacked some of the depth that was evident in Manchester, with previous finalists Cambridge and semi-finalists Manchester and Loughborough all missing from the field in Nottingham. The field still contained some quality: Bangor’s squad of recent graduates were well drilled and were clearly the best team present, Leeds brought players covering an impressive time span and maintained their competitiveness well and teams such as Bath, UCL, Liverpool and Sussex contained stand out players giving good accounts of themselves over the course of the weekend. Despite that, it was evident that there had been a steep drop off from the first year of the tournament to the second in terms of overall quality of teams. Lancaster vs UCL, Alumni Cup 2013. Courtesy of Blockstack Photography. What were the reasons for this drop off? 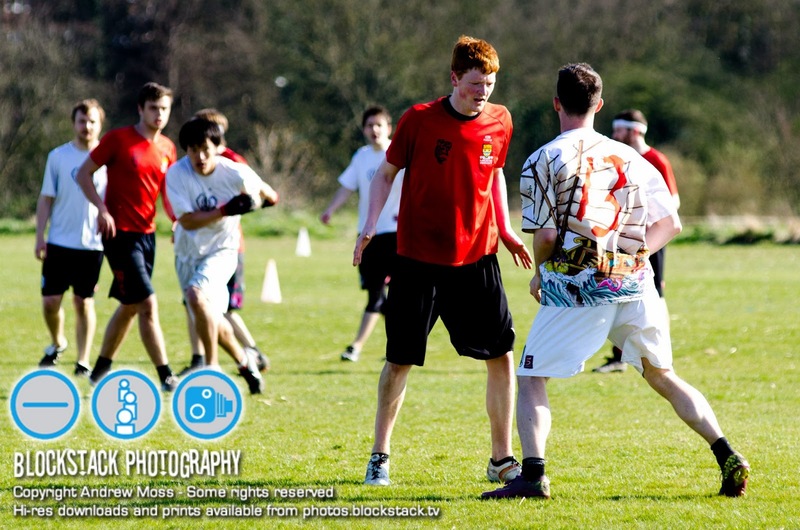 For one, pressure has been put on the calendar this year by the presence of GB teams and the importance of the coming season, with WUCC 2014 qualification depending on Tour positions. Players on the under-23 squads will have had three tournaments and one weekend session in April had they competed in Nottingham and so may have chosen to take a much needed rest while teams such as Fire had training weekends which took their players away from alumni teams who sorely missed their abilities. Another, more worrying, possibility is that the tournament was perceived as a novelty event last season: the first event to crown the champion of all alumni teams, effectively the champion of all university teams prior to that point. It brought together the best players from a wide range of eras for several universities and led to a tournament of impressive quality. This year that novelty diminished slightly, possibly keeping away those who are no longer regular players or those who decided that the weekend would be better spent resting their bodies for the season to come. Speaking from personal experience, the way my team-mates and I approached the Cup has not changed. We assembled a team of whoever we could think of that wanted to play and was free that weekend – no mean feat, believe me – and took the approach that as long as everyone played and everyone had fun results didn’t matter a great deal. Phat Eds very much took the reunion view of the tournament, which not surprisingly led to underwhelming results – 8ththis season bettered the 16th placed finish of 2012 but two wins in two years is hardly a stellar record – but I have certainly enjoyed both years and I’ve been proud of the effort put in by all of my former university team-mates and those other Phat Eds who have taken part. So what does the future hold for the Alumni Cup? It’s difficult to predict trends after two seasons, but next year will go a long way towards determining what it is that this event will be. If the tournament expands back to 16 teams and some of the talent that was not present in the second iteration of the tournament returns, it could make for an exciting, competitive and deep tournament which would be more like the alumni version of the university tournament it runs alongside (the fact that some current students have never known a Nationals without the Alumni Cup might mean that more current students stick around and help arrest that problem). However, if the tournament sees no further expansion or quality re-enforcement it could become a simple excuse to meet old friends and support your old university in their quest for BUCS glory. In last year’s issue of Ultimatum, Rich Hims suggested that when the tournament becomes suitably established it might be worthwhile to find an opportunity for the alumni champions and the university champions to determine a ‘champion of champions’. Hopefully the slight downturn this year can be arrested come 2014 and the Alumni Cup can become suitably established for such a consideration in the coming years. As a concept it’s well worthy of a place in the Ultimate calendar – the hope now must be that the concept tangibly realises the clear potential it has in the near future. Keep on reading, sharing, liking and tweeting!